The colony of the leafcutter ant is a strange parallel to human civilization. 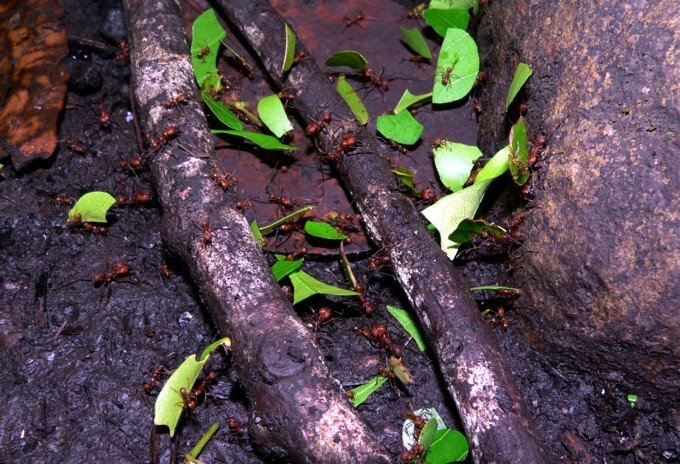 These ants can often be seen in tropical America parading down trails they create in the forest carrying small leaf clippings. When they return to their nest mound, the ants use these clippings as a substrate for growing fungus; the fungus is used to feed leafcutter larvae. Amazingly, ants are the only group besides humans to have developed agriculture. And leafcutter agriculture is more advanced than you might think – the ants use feces as fertilizer and they even secrete antibiotics to protect their crop from mould. Biologists and naturalists have often wondered how relatively simple insects like this can maintain complex social systems; systems that have been around longer than any human civilization and will probably still be here long after we’re gone. On one level, these systems work because social insects have evolved caste-specific division of labour. Within a colony, individuals are morphologically and behaviourally specialized to carry out specific jobs. A leafcutter ant colony will include a reproductive queen and various sub-castes of workers. Workers are content to give their lives to the colony without any hope of reproduction because of a quirk of genetics that makes them more closely related to the queen’s offspring than their own. But that still leaves open the question of how simple animals can organize themselves without any obvious authority to command them. How are the activities of various castes coordinated? To address this, scientists in the 1980s began to apply self-organization theory to the behaviour of social insects. This is the idea that a group of simple individuals following basic rules can produce a complex pattern. Self-organization theory has been successfully applied to explain everything from spiraling patterns formed by molecules to the movement of schools of fish and cars in traffic (see here for more). All insects would need is some simple built-in rules to govern their behaviour and the capacity for sharing information with others; if so, the adaptive complexity of the insect colony could be explained by the theory. Indeed, as early as 1989 researchers were able to demonstrate that self-organization explains how a group of foraging ants are able to pick the best path to a food source. They performed an experiment where ants were given the choice of two available routes to their food. Eventually the ants converged on the shorter of the two paths. And this happened without any individuals having knowledge or prior experience of either path! How could the ants in the experiment accomplish this? The answer is chemical communication. Research into chemical communication in insects took of in the 1960s when E.O. Wilson showed that foraging trails used by ants can be maintained by a positive feedback system of pheromones deposited on the substrate. Trails are reinforced by the deposition of positive pheromones. The more the trail is used by successful foraging individuals, the more the attractant pheromone is deposited and the more additional foragers will be encouraged to try that trail. In the experiment described above, ants traveling on the shorter of the two paths took less time, so pheromones accumulated faster on that route. This set up a positive feedback cycle, resulting in all ants making the right choice for the shorter path regardless of past experience – just as self-organization theory predicts. More recently, research has revealed chemical communication in social insects to be more detailed than was first imagined. For example, ants generally possess an arsenal of different trail pheromones for different purposes – repellent signals to mark unprofitable branch points that should be avoided, alarm pheromones to signal predators or other dangers, and often different short-lived and long-lived versions of their pheromones. Thus, foragers can communicate a surprising amount of detail just by excretion. And chemical communication isn’t the end of the story. Insects can also share a great deal of information through tactile and vibrational means. The classic example of this kind of communication is the waggle dance of the honey bee forager, which was shown in the 1940s by Karl von Frisch to convey information regarding both the distance and direction to a food source. Scientists have shown that ants use vibrational communication as well. For example, leafcutter ants that find a good leaf will rub their appendages together (called stridulation) in order to attract tiny hitchhiking workers. These hitchhikers ride on the leaf fragment on the way back to the colony and defend the forager from parasitic flies. Social insects are remarkably adapted for communication and one can imagine how the combination of various signals and modes of transmission allows insects to share the range of information necessary to run a colony (or farm, as it were). Indeed, the capacity for advanced communication is what sets animals apart from the simple units in other self-organizing systems (like molecules in a beaker or cars in traffic). Understanding communication in social insects is critical to helping us understand how these insect microcosms evolved in the first place, and may even teach us something about our own societies. More on communication in social insects can be found in articles here, and here.